Our church has chosen 2013 as our Year of Discipleship. This has led to much discussion about this concept, and how to translate it into focused activity--without killing it by turning it into the much-dreaded "program". Of course much has been written on this topic by scribblers more competent and qualified than I. Still, perhaps it is useful to share the state of my thinking in the practical world of "how to make this real" for a local church. 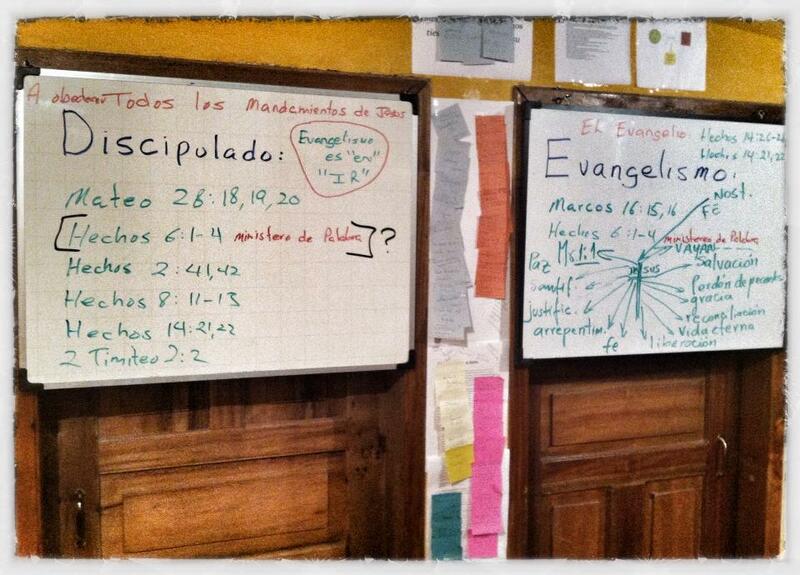 Miguel's whiteboards, which led him to wonder if we make discipleship too complicated. My thinking on this question begins here--discipleship is really about two things: relationship and purpose, or perhaps more specifically purpose in relationship. There are many fine strategies and tactics out there, but somehow it always comes back to these two things. Relationship: The church is relationship. It is the body of Christ, vitally connected. Purpose: The church grows up into the head--which is Christ. This gets more practical when we consider its implications. Those who do not have Christ desperately need him--we call this evangelism. Those who have him need him more fully--we call this discipleship. It is when every relationship is infused with Christ’s purposes that I will truly be a maker of disciples. Everything else–classes, books, meetings, campaigns, etc.–flows back to that central idea. This is a very current thought process for me, as my church is currently weighing the practical implications of our Year of Discipleship effort--which is itself yet another tool (a "campaign") to help concentrate the minds of the congregation. Therefore I value any readers' thoughts, experiences, etc. Appreciate your comment on my site.. looks like we are on a similar page.. the pragmatic theorists.. we need more of them.. see ya! I'm not too keen on church programs but here are my two biased cents: Programs kill because they are too heavy on self-efficacy and planning and too light on letting God be God, and I don't think there's a good formula that can fix that dilemma, only faith. People get bent out of shape when they plan to do good and their hearts' desires to please or purpose God's plan become unhealthy demands. Proverbs 16:9 and 19:21 come to mind. I was hoping to see more feedback cause I really struggle with this church program thing. How do you program Christ who is not only the body but the head? Petra - A worthy discussion and a difficult topic, and one that has occupied much of my attention within the context of our church over the past 5 years. I don't think there is a silver bullet answer. I believe there is only a long obedience in the same direction, while we labor alongside those we have been given and encourage them to be more like Christ. As the Holy Spirit works through our obedience, we see him change them as well as us. I have not been assigned the responsibility to change the lives of millions, or thousands, or hundreds--or perhaps even dozens. But for those whom God has given me, I will labor to see His work done. Every once in a while He allows me a brief glimpse at a little of the fruit of my labor for Him, and that gives me courage and hope to continue.